In Europe and also in other regions the implementation of regulations and codes is accelerating. On the one hand it imposes more work and overhead for all parties involved in construction, on the other hand it has the intention to increase the quality of construction, and thus must lead to efficiency, safety and long term cost reduction. For welding the EN 1090 is enforced ultimately by 1 July 2014, imposing CE Marks on all construction parts. Another code, ISO 9606-1, on the qualification of welders will soon be enforced internationally. Scia is ready to help its clients with software to facilitate the application of these codes. We are pleased to announce the availability of CIM-Weld in Scia Steel - welding information software that manages the welding process in conformity with the above mentioned codes. 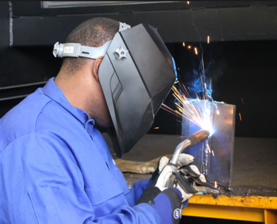 It covers weld generation from CAD systems, welding procedures & categorization, execution management (registration, checks) and documentation (certificates) including bar code for automate registrations and delivery of management reports on welding (per project, per period, per welder). BIM (Building Information Modelling) gets into steel fabrication. For more information, contact m.wettinck@scia-online.com.